Storyboard Pro supports four types of layers: Vector drawing layers, bitmap drawing layers, 3D layers and groups. Vector Layers: Vector drawings are made of points and curves that compose the contours of the shapes of the artwork, along with the colour or textures these shapes are filled with. Hence, the artwork in vector layers can be scaled up and zoomed in without losing quality, unless they contain a texture. When drawing on a vector layer, each drawing stroke and pencil line is a separate object which can be manipulated individually. You can select single drawing strokes, then move them around and transform them, even if drawing strokes were applied over them. Additionally, because drawing strokes are made of points and curves, it is possible to edit their shape, making it easy to make corrections and changes to your artwork. Bitmap Layers: Bitmap drawings are composed of a grid of pixels, which are small points that each have a single solid colour. Bitmap drawing tools allow you to lay on brush strokes onto a single flat canvas, and to tweak your artwork by the pixel if needed. 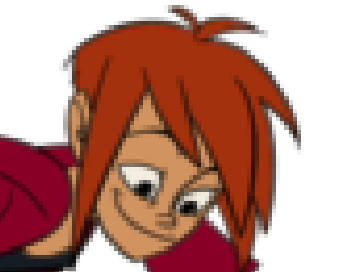 When you draw on a bitmap layer, each stroke is composited into the canvas, so it remains a single drawing that can only be painted or erased upon, but which does not allow you to tweak individual parts of it. Bitmap artwork can only be scaled up or zoomed in on as much as their pixel density allows without losing picture quality. By default, bitmap artwork has a pixel density of 100%, which is only enough to display the artwork without zooming in on it or scaling it up, otherwise Storyboard Pro must generate new pixels within the artwork, which is liable to make it look blurry or pixelated. Hence, you might want to set the required pixel density for your bitmap artwork, based on whether you'll need to zoom on it or scale it up, before you start drawing on a bitmap layer—see Setting the Resolution of Bitmap Layers. 3D Layers: When you import a 3D model into your library, adding it to a panel will store the model into a 3D layer. 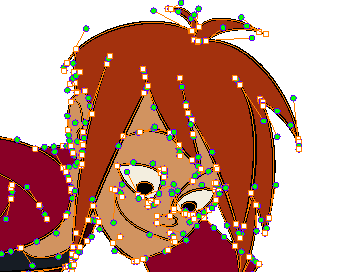 You can then manipulate and animate the 3D model, just like you can with a drawing layer. Group: A group can contain several layers of any type. Just like you can transform and animate a layer, you can also transform and animate a group. Transformations and animations applied to a group will affect every layer inside the group simultaneously—see Grouping Layers. 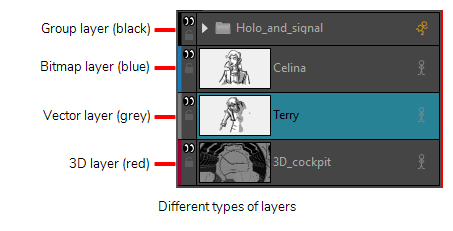 In the Layer panel of the Stage or Camera view, layers can be quickly identified by their type by referring to the small colour bar on their left edge.